Hôtel La Réserve, Paris, one of the city's best kept secrets. Paris is a city of many secrets, but given I have been travelling there for over 20 years, I didn’t think there were very many left for me to find. How refreshing to not only discover I was wrong, but that Hôtel La Réserve Paris is one of the world’s most beautiful, personable and luxurious hotels in the city of love – and hardly anyone knows about it. I often hear from travellers looking for a luxury experience, and too often they say they pay a lot of money but come away feeling as if they didn’t get what they paid for. This will not happen at Hôtel La Réserve, an astonishing hotel in the heart of Paris. 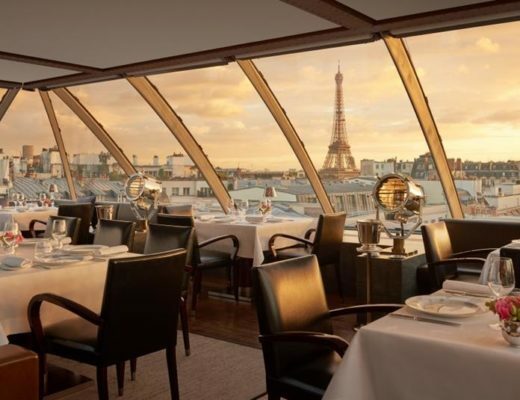 The hotel itself is the former Paris home of fashion designer Pierre Cardin, so it is intimate, but stately and has all of the decadence and architecture of a classically elegant old Parisian building. Staying here is like staying in a friend’s mansion. It’s unique feature is the combination of absolute luxury and absolute intimacy, as the staff are a level above any expectation you could possibly have. They think of things you need before you even know you need them. Every one of the 40 rooms has a butler, and these are not your every day five star hotel butlers. These staff members do absolutely everything for guests from a quick steam of a dress before going out, shopping, making your favourite cocktail – my butler even painted my nails for me as I was running late for a lunch and was in desperate need of some last minute grooming. The service is way beyond anything I have seen anywhere. There is an outdoor courtyard which for six months or more of the year is a glorious place for lunch for an afternoon champagne. The stunning opulent, luxurious yet calming rooms at Hôtel La Réserve Paris. Each of the 40 hotel rooms is extraordinary, and large. Many have views of the Eiffel Tower. The hotel rooms feature some of the most stunning hotel bathrooms in Europe, with separate showers and baths, and they even have their own fragrance ( which is divine). These are the kind of bathrooms you don’t want to get out of. The sheets are the best money can buy. The hotel group even produce their own champagne. The staircase at Hotels La Réserve is majestic. There is a magnificently appointed spa in the basement which has its own swimming pool, another absolute luxury in Paris, and sumptuous treatments to take away any stresses you may have. The Courtyard at Hôtel La Réserve, Paris. Breakfast at Hôtel La Réserve is served in an intimate gold gilded lounge area, with plush red velvet seating and French ornate mirrors everywhere. I loved The Japanese breakfast on offer. I didn’t dine in the much lauded restaurant simply because I didn’t have time, but I certainly will during my next stay. The hotel’s own bar is a highlight, as are the chocolates at the bar at midnight. This is where guests congregate to discuss their day in Paris and talk about life for a while. Renae Leith-Manos at Hôtel La Réserve in Paris. This is the kind of hotel to celebrate all that life is. It is impossible not to feel elated staying here. Who should Stay here: Couples celebrating absolutely anything. Location: Could not be better, quiet but right in the heart of Paris. Two minutes walk from the Champs Élyseés. Best culinary delight: The Japanese Breakfast (and the Hôtel La Réserve chocolates). The lowlight: Checking out. I wanted to stay a lot longer than two nights.